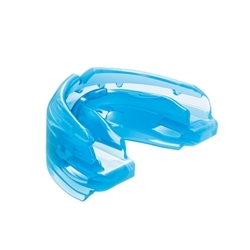 Protection for athletes with braces seeking protection for both upper and lower teeth. The Double Braces mouthguard is specifically designed to conform to upper and lower brace brackets for instant comfort and prevention from lacerations. Made with 100% medical-grade silicone, it adapts to changes in mouth structure as teeth adjust. Available in strapped or strapless versions. BRACES FIT: Specifically developed for use with orthodontics. For Ages 12 & Up.